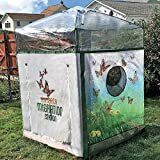 Transform a small section of your backyard or patio into a magical habitat for majestic Monarch butterflies with this cool new Monarch Migration Station. This compact greenhouse not only acts as a nursery for Monarch butterfly larvae to hatch, crawl, cocoon, and transform into butterflies, it also doubles as a safe sanctuary away from predators as they feast upon the included raised planter bed with a seed mat of nectar plants and milkweed. 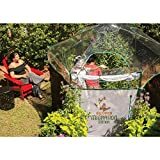 It features a transparent PVC roof that lets in sunlight while blocking UV rays, nylon walls with polyester netting, and round openings that allow the butterflies to come and go as they please. A fun way to get out of the house and enjoy nature for both kids and adults alike.